Hi, stampers! Hope you all had a wonderful Labour Day long weekend. We went to Seattle on Friday and visited the Pacific Science World (I think that's the name) and the Pike street Public Market Place. We didn't know it closes at 5pm so we didn't get to see much of the market place. We stayed overnight in Tulalip and went home on Saturday. Went dim sum and shop in China Town and did some preparing for school on Monday. That was my long weekend. Not very exciting. Anyway, on to the card. I did the faux tearing technique for the background on a light colour card stock. 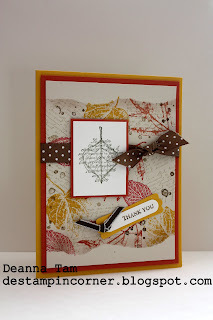 Add some elements and the card was done. Very simple technique.